The best part about working from home is that you can go to work in your pajamas, right? Well, that certainly can be a perk. 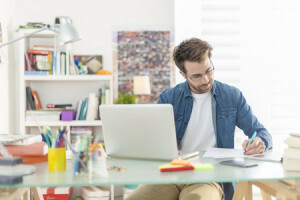 Working from home can give you great freedom. You have the flexibility to work when you want to and the freedom to do it however you want to. But sometimes all that freedom leads to the enemy of work: procrastination. It’s just so easy to put off getting your work done when there isn’t someone to hold you accountable. So how can you make it easier? With these tips. 1. Ditch the pajamas! While they might be more comfortable, getting yourself ready for the day will help you feel professional and accountable. Take pride in your appearance and make an effort to at least do a casual look that’s more business appropriate than sleepwear. 2. Schedule your time. It’s so easy to get caught up in your daily life tasks that work can get pushed aside. Schedule your time so that you can fit in housework and family time but get your work done too. Set boundaries and stick to them, and you will be more productive. 3. Create a work space. Even if you work from the kitchen table, set it up in such a way that will help to facilitate efficiency and make you feel like you can get the job done. Keep what you need to work close by. Then you won’t have to go searching all over the house for it and possibly get distracted. 4. Don’t turn on the TV. While it is tempting to work with the TV on, it won’t help you get your work done. Turn off any distractions that will slow your progress and work in intervals. 5. Take advantage of your free time. This is the best part of working from home: having the free time to get other things done. If you set up your free time as a reward system for getting work done, you will be more motivated – and it will mean more when you finally make it to that blessed free time! Working from home is a great opportunity to build the life you want. Having the time you want for your family, hobbies and passions is important. It’s what will motivate you to keep succeeding. All you have to do is put in the effort to manage your time, and you will find that success will follow!